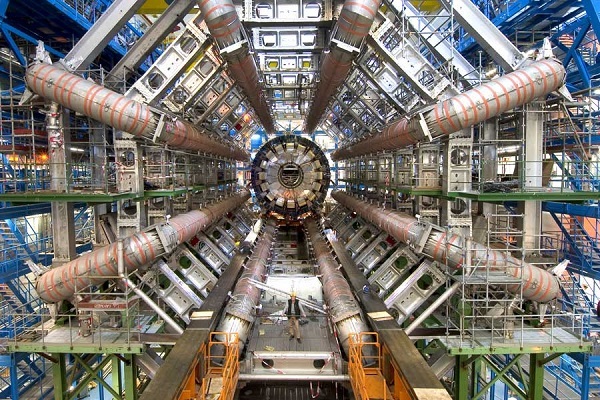 Large Hadron Collider – Photo credit: NASA.gov. I really appreciate NASA’s policy for using images because NO ONE will let me near this thing. Hey sports fans, big news today at the Large Hadron Collider’s (NYSE:LHC) in Geneva! As part of their ambitious bid to recreate the Big Bang and destroy the existing universe, scientists at the European Organization for Nuclear Research, or CERN (WTF?) confirmed that high-energy meson collisions can be both fun and educational! “YES! We have triadaptive amplification of the sub-atomic resonance metaphasic deflection signature in the phase transition coils!” exclaimed Doctor Sheldon Cooper, one of the science dweebs. Above, his space alien overlords watched monitors from high geosynchronous orbit. “The hyperlinear alignment initiater, using a tetra-nucleonic articulation stabilizer, has found evidence of magna-spatial fluidic radiation!” he added. We assume that’s good. In the Oscillation Overthruster control room, scientists erupted with applause and downed multiple shots of Jack Daniels when the first successful octa-caesium energy stream pulses were confirmed. Their colleagues from around the world, as well as two other parallel worlds, and a gathering of time-traveling bunnies were tuning in by remote links across the Sub-Etha to witness the event. The extra energy in Geneva is expected to reveal even more about the unanswered questions of hyperosmotic thermal physics, ultraviolet properties of Multi-loop N = 8 Supergravity wells, and hopefully prove the existence of the the Higgs boson, a hypothetical particle that scientists theorize destroyed the planet Krypton. Yesterday’s initial attempts at collisions were unsuccessful because problems developed with the atomic batteries — an energy degradation of a zorton beam revealed localized harmonic interference in the singularity, said scientists working on the massive machine. That meant… Oh, who cares, it’s not like anyone reading this isn’t asleep at this point. The atmosphere at CERN was tense considering the project was sidetracked a year ago when someone spilled a Pepsi on three of the large quadcrystalline magnets, causing a chronotron particle leak in the antinucleonic turbine, resulting in hull plating buckling and degradation of the Illudium Q-36 Explosive Space Modulator. It cost $40 million to repair the tetra-anion reaction discriminator and to align the core element of the FTL nanoprocessor with 25 bilateral kelilactirals. With 20 of those being slaved into the primary Heisenfram terminals, it was necessary to override the phase compensator to prevent a cascade failure in the warp core and also to order 3000 “No food or drink in this area” signs for the 17 mile tunnel. Since its restart, the CERN collider has performed almost flawlessly (except for that fiasco when Greenland was destroyed in an antimatter blast) and given scientists valuable data, including the rate of emission of neutrinos generated by quantum filaments captured in a DTMFA nucleocentric containment matrix. Again, we assume this is a good thing. These achievements quickly eclipsed the next largest accelerator — the Omegahedrom, a top secret United States military supercollider, located beneath a fake agricultural station 12.5 miles south east of Travers City, Michigan. This writer confirmed through extensive research (Wikipedia) that the latest CERN experiment DID yield a Hartle-Hawking initial state, followed by a super-string landscape. Brane inflation was absent, but the ekpyrotic universe constant was clearly within super symmetry parameter. What this means, I have no clue, man. I mean, I got nothing. Really bad day on Planet Earth. Photo credit: NASA.gov. Again, I really appreciate NASA’s policy for using images because my access to the Hubble Space Telescope has been restricted since I used it to get high quality Justin Bieber concert images. Yesterday at CERN, two beams of protons began to speed at high energy (1.21 gigawatts) in opposite directions around the tunnel, which is the coldest place in the universe, at a couple of degrees above absolute zero, much like my ex-girlfriend Betty’s heart. CERN used high-tech doodads and thingies to force the two beams to cross, creating a collisions and showers of particles that accidentally drilled into an electromagnetic pocket, releasing a catastrophically dangerous amount of electromagnetic energy. “It’s working! We’ve done it!” shouted one scientist, just before power failed across the planet Earth and the ground began to shake as a black hole opened at the center of the planet. Moments, later, half of the Earth imploded. 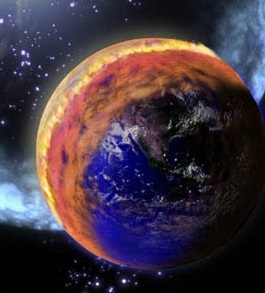 However, a top CERN official said the four-thousand mile swath of destruction across the planet at the exact moment of the experiment is “pure coincidence,” and there is absolutely no evidence to connect the two events. To end this story on a happy note, at least we don’t have to read about Lindsay Lohan or Brittney Spears anymore.